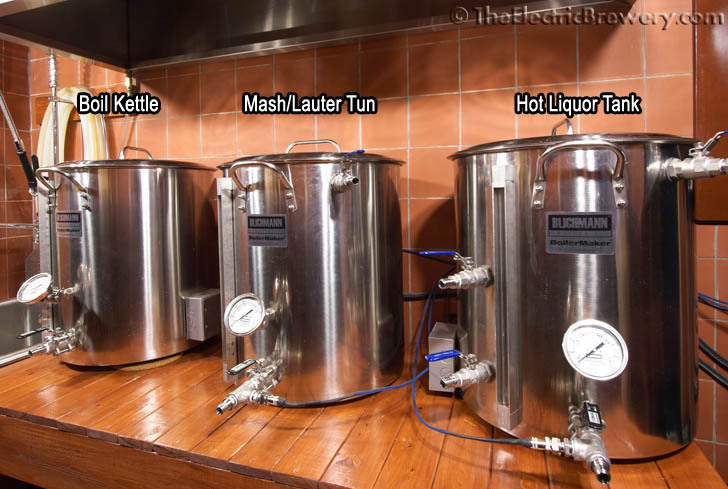 Making beer requires the use of a lot of hot water, often at very specific temperatures. We use 'strike' water to soak or 'mash' grain at very specific temperatures to release sugars and then later use 'sparge' water to rinse off the sugars. This where the Hot Liquor Tank (or HLT) comes in: It's our source of hot water that eventually becomes beer. In brewing terms, the hot water is called 'liquor', hence the name 'Hot Liquor Tank'. In case it is not obvious yet, brewing is full of all sorts of odd-ball terms just to make things more confusing for the new brewer. We also use the HLT to maintain very specific temperatures as the grain is soaked or 'mashed'. This is done through a heat exchanging coil that sits in the HLT that's been given the fancy name of 'HERMS' (Heat Exchanged Recirculating Mash System) by brewers. We set the desired temperature on our control panel and as the grain is soaked in the Mash/Lauter Tun (MLT), the liquid or 'sweet wort' is pumped through this coil in the HLT to compensate for heat loss that occurs over time. The Hot Liquor Tank (HLT) is used to heat water. Grain in the Mash/Lauter Tun (MLT) is mixed with hot water. The resulting liquid is recirculated through a HERMS coil in the HLT to maintain temperature. Temperature losses over time due to stirring, poor insulation, etc. Our setup also ensures that we can precisely control the ratio of water to grain (called the 'mash thickness') in order to create the intended flavour profile. We never add hot or cold water to increase or decrease the temperature so the mash thickness stays consistent. Mash thickness is not one of the most critical factors in brewing but it's one of the many factors that when controlled correctly can take what would normally be considered a 'good' beer to 'great'. It may seem confusing now but all this will become clearer later when we show the entire setup in action and provide step by step instructions for use (see our Brew Day: Step by Step article). For now, let's build the HLT! 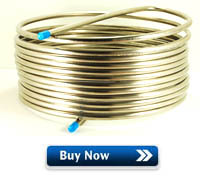 The heating element should already have been added to your HLT as per our Heating Elements article. The instructions below will now show you how to install the HERMS coil with two ball valves, a water input ball valve at the top of the kettle, and a 'T' connection on the kettle output for a temperature probe.